When I first introduced Kevin to my family, it didn't take long before he was included in every single hangout, party and Sunday barbecue at my folks place. Coming from a small family, Kevin found himself overwhelmed by how much cooking went into our run-of-the-mill get togethers. He also couldn't believe how much fruit and veg my mum kept the place stocked with. I had never really noticed it until Kevin brought it to my attention, but whenever my mum had last minute drop ins, the first thing that was offered was fresh cut fruit and veg. I was so used to having so much of it around, that it translated into my own way of entertaining. So it's suddenly that time of the year where the sun shines later, nights are warmer, and friends stay a little longer. Here's my go-to list that keeps my pantry and refrigerator in check for last minute entertaining. Crudités The only thing you need to know about preparing crudités is how to use a peeler and a knife. Refreshing and light, serve fresh cuts of seasonal and colourful veggies with a gluten and dairy free drip like hoummos, babaganoug or spinach dip. Guilt free snacking at it's best. 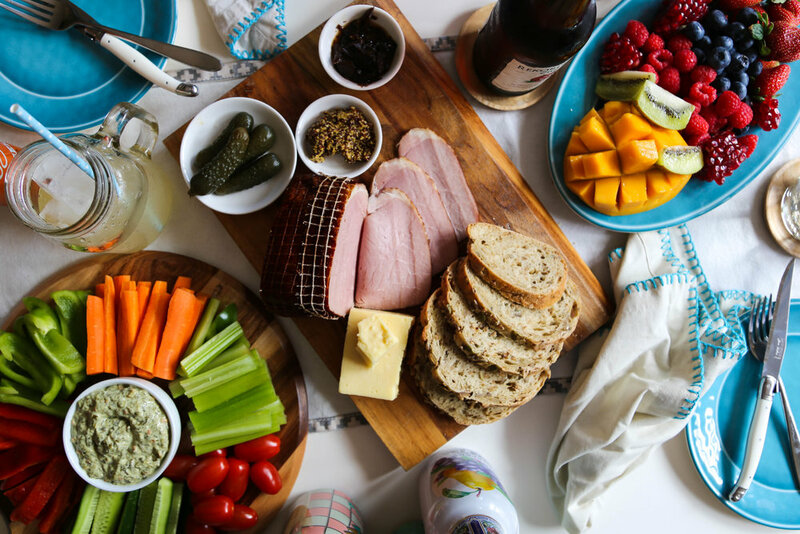 A Simple Ploughman's Platter Nothing says summer more than a great smokey chilled ham, crumbly cheddar, seeded bread and a cold cider to boot. Traditionally, you'll also find boiled eggs on a ploughman's platter, but this is my version that incorporated next to no prep time and no cooking elements! Keep some chutney, mustard and pickles in the fridge - they make the perfect condiments for the ham and cheese. Our cider of choice for this summer is Rekorderlig's latest flavour addition, pomegranate. Summer Fruit This summer fruit platter has my mum's name written all over it. If there's one thing my mum is always over stocked on, it's fruit. No complaints from me though, she could always throw together a killer platter in no time. And how could your surprise visitor resist this? Ginger Beer I remember my late Uncle Johnny serving up ginger beer in colourful aluminium cups. My sister Jess and I would play soccer in his backyard until sunset and end up inside for a drink of what we genuinely thought was the same beer he was drinking. We thought we loved beer. When Jess and I caught up last week, we cracked open a few cans of Buderim Ginger's Ginger Beer. Instantly reminded of our Uncle Johnny, Jess said it was the best ginger beer she has ever tried in her life. In other words, keep it stocked up big sis. Something savoury While I've never been crazy about potato chips, my friends and family adore the stuff. We recently discovered Tyrrells English Crisps- they're one of the fastest growing premium crisp brands in the UK and recently landed on Australian grocery shelves. Available in six great flavours –Sea Salt & Cider Vinegar, Lightly Sea Salted, Sea Salt & Cracked Black Pepper, Sweet Chilli & Red Pepper, Mature Cheddar & Chive, and my sister’s favourite - Sunday Best Roast Chicken.